Also Plays Under: "Browndog19" on Full Tilt Poker. "Browntown19" on Pokerstars. "Browndog" on Bodog. Online Notes: "Browndog19" has emerged over the past 6-8 months as a force to be reckoned with on the virtual felt. Most people first heard the name "Browndog19" during the $25,000 Heads-Up PLO Championship on Full Tilt Poker in November of 2009. "Browndog19" defeated "Ugotabanana" in the event to take home the title and about $320,000 (the two players had agreed to a chop prior to the final table taking place). "Browndog19" outdueled players such as Josh Arieh, Justin Smith and Harry "Ugotabanana" Kaczka en route to the title. When Brown took down the prestigious online tournament, many people wondered exactly who he was. To those that knew him though, this victory was no fluke - Brown is an extremely talented poker player who seems to thrive playing Pot Limit Omaha. Since his victory in the $25k PLO event, "Browndog19" has been seeing playing in some of the biggest cash games on Full Tilt Poker. According to Pokertableratings.com, "Browndog19" made about $600-$700k in late November / early December, but has since given most of that back. One thing is for sure though - he is certainly not afraid to play against anyone. 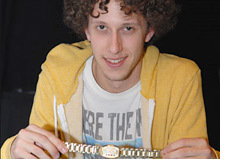 Live Notes: Andrew Brown also has a World Series of Poker bracelet to his name, winning the $2,000 Omaha Hi/Lo 8/b event in 2008 for just over $226k. This victory was certainly no fluke, as Brown had to overcome talented players such as Ted Forrest and Scott Clements at the final table to take down the bracelet. Brown currently has around $230,000 in lifetime "live" tournament cashes over his short career. Given his level of talent, you can safely assume that Brown will pad these totals in the years to come. Other Notes and Info: Born in New York. Was looking to get into hotel management as a career before deciding to try playing poker for a living.